I think it’s safe to say we’ve all experienced one of those days where you feel like you’re starring in Daniel Powter’s “Bad Day” music video. I was having one of those days recently. I hadn’t been at work for more than five minutes when three different parents called back-to-back to express complaints. After calming them down and dealing with the situation, a woman walked in to sign her two sons up for swim lessons. In an effort to make her feel welcome, I was very friendly and asked her how her children had enjoyed the previous programs they participated in with us. The woman responded by stating that she “really didn’t have all day and had already been in our office for far too long.” I felt defeated. 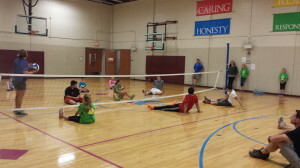 Does anybody appreciate all of the hard work that the YMCA does? A few minutes later the phone rang. I took a deep breath and prepared myself to deal with an angry or unhappy parent. Instead, it was a very cheery father calling to sign his son up for basketball. As I went through the enrollment process, the man began to rave about how much his son loved our flag football program and had such a great time with our new Program Director, Will. They both loved our Y so much in fact, that they travel all the way from Wethersfield to come to us! My spirits were up after that call. Even though his many praises had nothing to do with anything that I had personally done, it still felt good to know that there are people who recognize what the YMCA does and are thankful for it. There are going to be those days where it feels like all you’re hearing is complaints, but for every ten negative comments there will be one that reminds you why you work at the Y.
I was asked to speak at an ESPN Lunch n’ Learn through ESPN’s Enabled focus group for persons with disabilities. A Lunch n’ Learn is where guest speakers are invited to speak to their employees and to share their story. It was my turn today to share my story of my involvement with the Paratriathlon program and how it has changed my life. The panel of speakers consisted of Shane Mosko (paratriathlete), Tom Branchaud (paratriathlete), Susan Grigely (Wheeler Y Tri Club member and volunteer) along with myself. I had opened up the lecture with a 6 minute slideshow of photos of the 2012 and 2013 Madison Sprint Triathlon along with photos from this years Hartford Marathon. Images speak a thousand words and the slideshow had a great impact on the crowd. From there I told my story. A story that have told to so many others several times and a story that I do not get bored of sharing. We each had a chance to talk about the impact this program has had on our lives, what we had learned as volunteers and as athletes, what more we want to do to help others and spreading the word that just because you have a disability it doesn’t mean you “CAN’T” because you CAN! This is what it looks like when a team becomes a “family”! 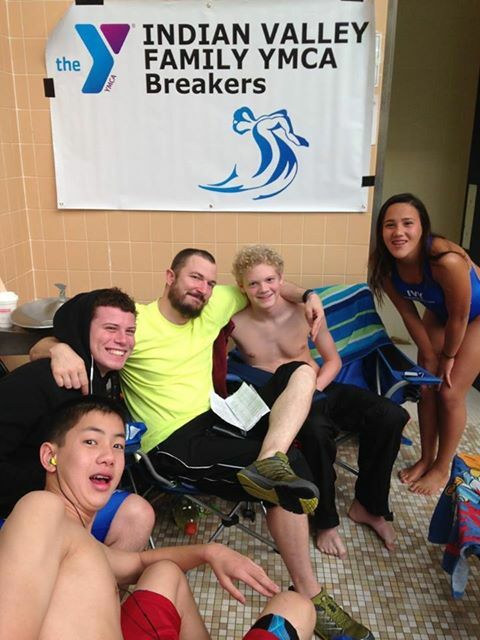 Way to go Indian Valley Family YMCA Breakers! Josh and I couldn’t imagine who put this together in the back field, but it sure did put a smile on our faces. 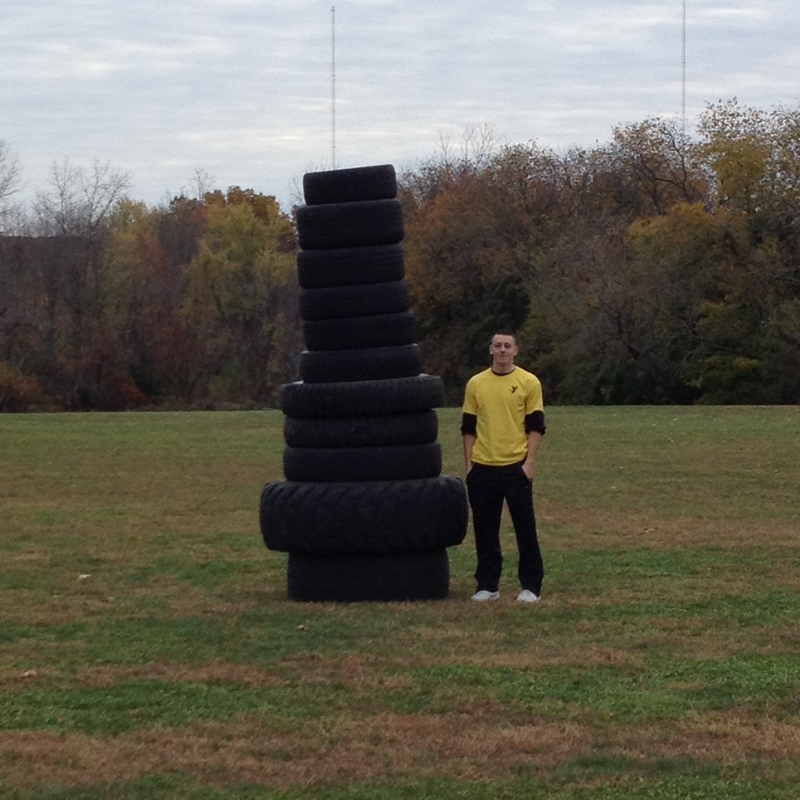 Josh is 6′ tall, so this “monument” must be about 11′! Indian Valley Family YMCA member are trixy tricksters and mighty strong to boot! Parents want to play too! 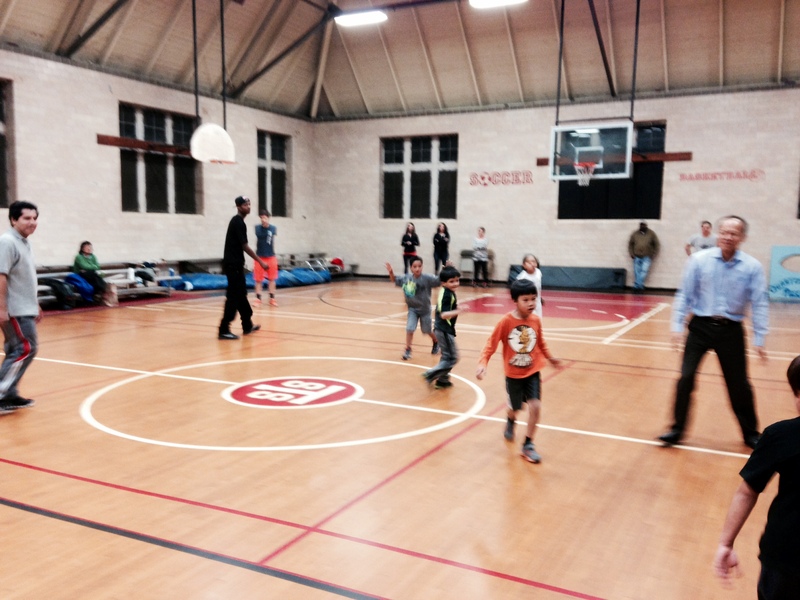 Yesterday was the last class for our West Hartford YMCA Basketball Clinic. 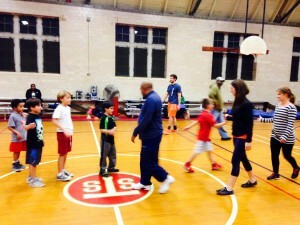 We hosted a parents vs. kids basketball game! 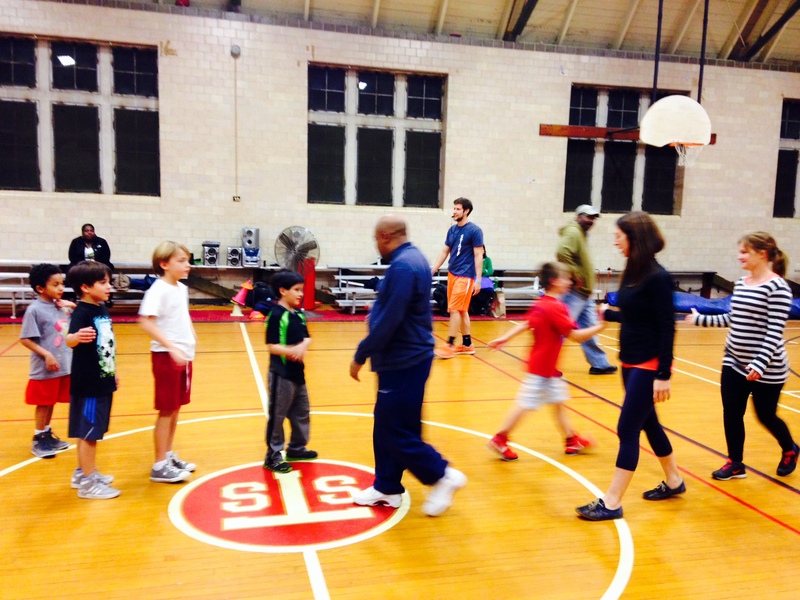 The game was intense and exciting – capped off by a last-second buzzer beater by one of the kids, Cole! Like in every job, there are always days when we wonder why we are doing it. Sometimes we feel that no matter what we do…it isn’t enough or even at times, that what we do isn’t appreciated. However, today was different. Today I was reminded why I am here and why I love what I do. It is these moments when I realize the impact of what we give to people. For this woman it is a fresh start, a new beginning. I told her if she needed anything to make sure and call me or stop by and see me and I would do what I could to help her. Less than hour later she called me to ask if I knew where a thrift shop was that she could buy some inexpensive work out clothes. She was so excited to get started on her journey….that’s what we are all about and that is why I love my job. 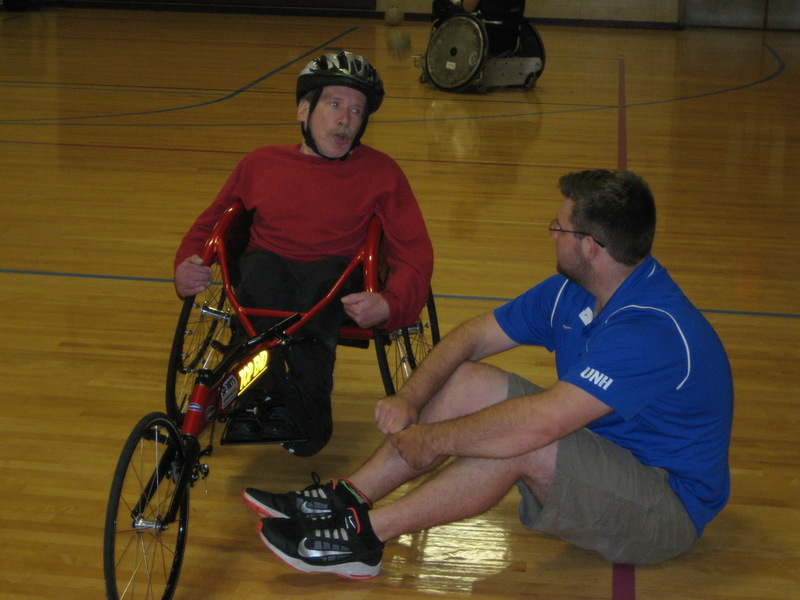 On Sunday October 6th we hosted our first annual Paralympics Day to help kick off our new Adaptive Fitness and Sports program. Northeast Passage from New Hampshire and Gaylord Hospital brought in racing chairs and hand-cycles for our members and guests to demo. 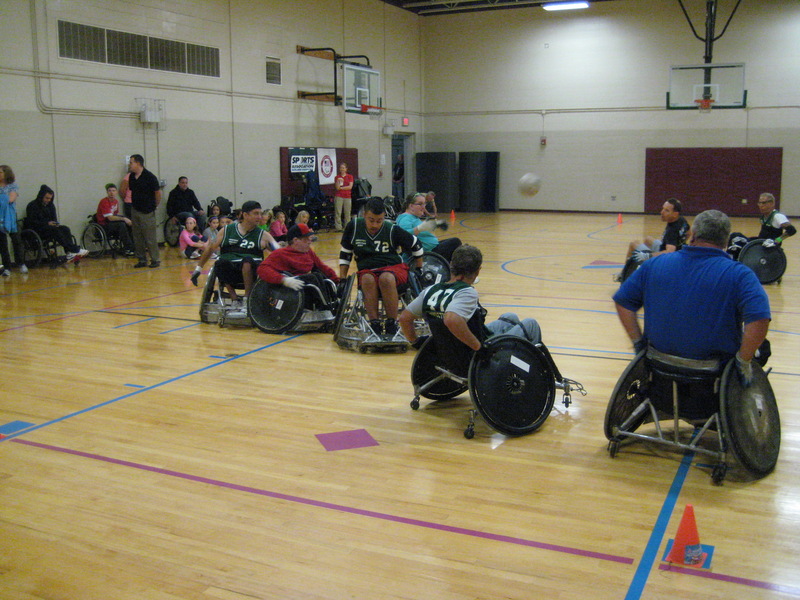 A mean game of wheelchair rugby was played thanks to the Gaylord Jammers Quad Wheelchair Rugby team, and we showcased our new program ADAPTIVE VOLLEYBALL which will run on Monday nights starting on 10/28. Not only did we just play but we also had some amazing representation from our friends at Achilles, Fidelco, Independence Unlimited and the NEAT Center at Oak Hill that had tables of brochures, equipment and even a gorgeous guide dog! 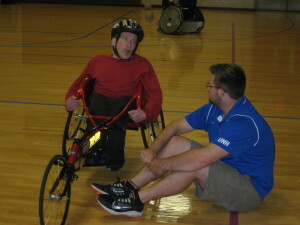 Our Adaptive Fitness and Sports program is up and running and will help individuals with disabilities reach their fullest potential through support, fellowship, health and wellness. 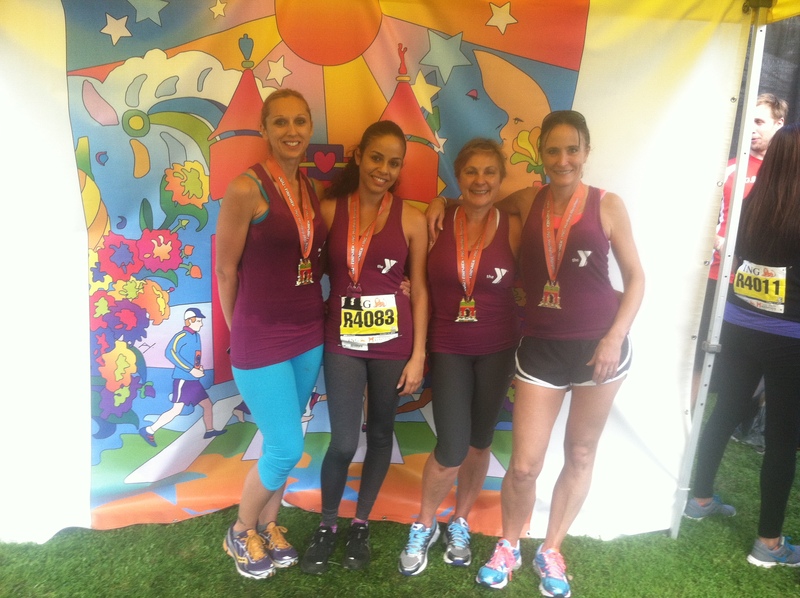 As part of our partnership with the Hartford Marathon Foundation, the Greater Hartford YMCA played an important role in the ING Run for Something Better and the Hartford Marathon. 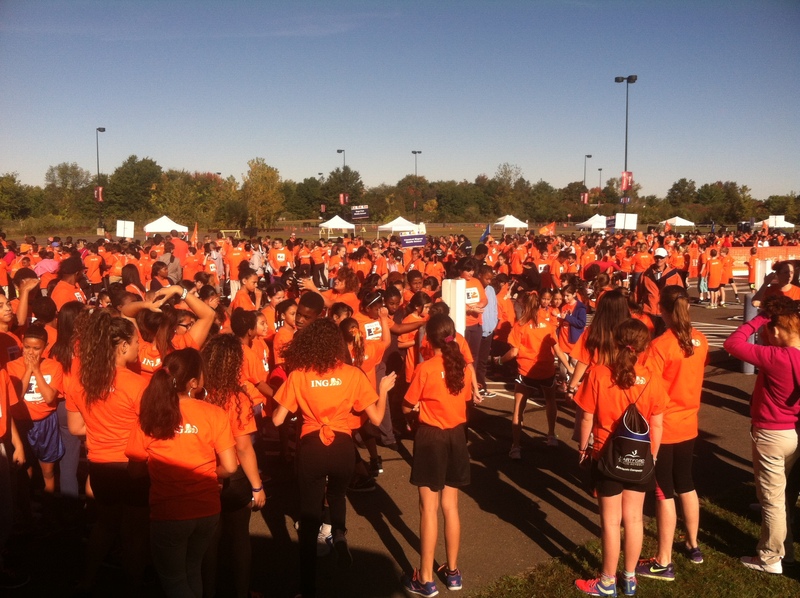 The ING Run for Something Better was held on October 8th at Rentschler Field in Hartford. 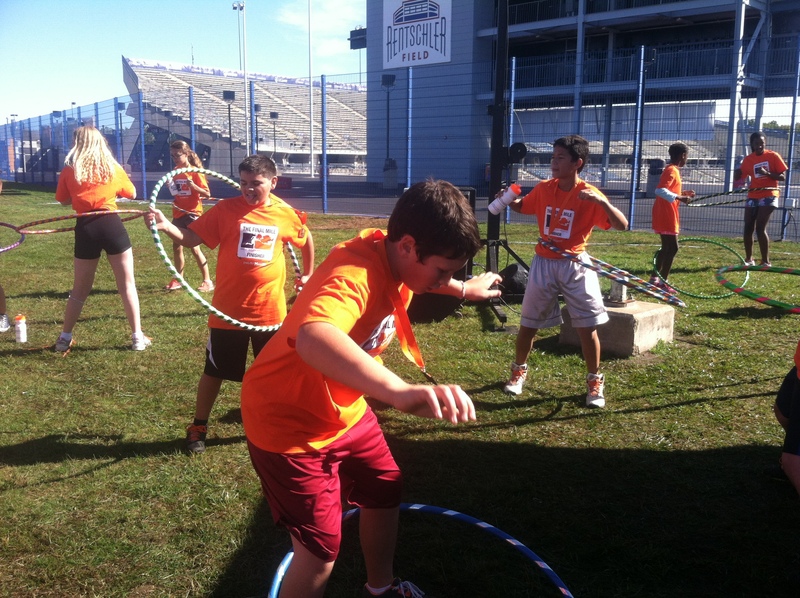 Students from all over the state of CT, logged miles leading up to either a half marathon or full marathon and came together at Rentschler Field to run the last mile together will over 2,500 other kids. After they finished their 1 mile run, they took part in the World of Fitness which was made up of 10 different vendors and exhibitors offering different sports for the kids to try out. The idea of the World of Fitness Expo was to introduce kids to other ways of getting healthy that they may not already be aware of. 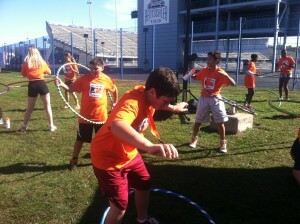 We had exhibitors doing hula hooping, soccer, golf, yoga, theater games, cross fit and zumba. The Hartford Marathon Foundation does such an amazing job re-creating the Hartford Marathon finish line so the kids really felt like they were part of the real event. For some of these kids this was an opportunity of a life time to be part of something like this. It was just amazing to watch!! Then…on Saturday October 12th was the Hartford Marathon!!! Over 15,000 runners took part in the 20th running of the Hartford Marathon. The Greater Hartford YMCA had a booth at Bushnell Park for members to leave their keys and bags at while they run the marathon, half marathon or 5k. Also, the Downtown Y opened it’s doors to runners to shower after the marathon! Our RunHers group at Downtown took part in the marathon relay with our CEO, James Morton, who ran the last leg in record time!!!! They had a fabulous time and represented the Y in style!! Several other members of the Y family also took in the events that day. Kristi, April, Heather and Tony Gronski all ran the half marathon and amazingly well. Wilson-Gray YMCA Site Director Carlos Almendarez has been building strong relationships with the adminstration and staff of the Betances STEM School, where the 4th and 5th grade students of his program attend. 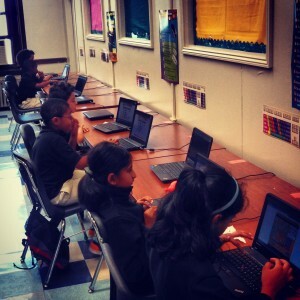 These relationships have granted the after school program access to the schools computer lab starting this month on Tuesdays and Thursdays. The partnership with the school will be supporting the efforts of the school day by allowing the students to work on the First In Math program. First In Math facilitates a response where students are eager to practice mathematics. Improvement is self-directed and new habits replace old, unproductive habits. Each student has an individual login ID and password that will allow them to work on both of these great programs at school and at home. The goal of this partnership is to give the students extra time to master these programs and skills. Significant results can be achieved in only minutes a day. My Junior year of High School I decided to apply for a job working as a Camp Counselor at the West Hartford YMCA. After all, those juicy pants weren’t going to buy themselves right? I had a few friends who had already applied, so I thought that this would be the perfect opportunity to hang out with friends while making some money to spend at the mall. Applying for materialistic reasons, I never could have predicted how much of an impact the children at camp would have on my life. My first week was tough. Waking up at 6 am and running around in the sun all day with a group of energetic children is definitely a draining task. Most days went by smoothly and then there were those days when everything seemed to go wrong; one of my campers got stung by a bee, one camper broke another camper’s favorite water bottle or someone was upset about not getting picked in duck-duck-goose. At times I became frustrated and wished that I worked somewhere else , but all of that changed the day a camper named John was put into my camp group. John was a quiet kid and despite my efforts to connect him with the other campers, he usually stayed by my side. One day as we were working on an arts and craft project, John looked up at me and told me that he felt sad today. When I asked him why, he told me it was because he wasn’t sure when he was going to see his parents again and he missed them. John was living with a foster family. I’m not a person who cries easily, but seeing the sadness in John’s eyes as he explained how his parents “couldn’t take care of him right now” made me tear up. I told John that whenever he feels sad he can call me and I’ll cheer him up. I wrote my number on a piece of paper and gave it to him, figuring he would throw it away or lose it. One year later I began my freshman year of college and the last thing on my mind was the YMCA. I was chatting with some new friends when I got a call from an unknown number. Figuring it was a telemarketer I answered the call, prepared to tell them that I wasn’t interested. But to my surprise, it was John. He told me that he missed me and asked if I was working at camp again this coming summer. Keeping my promise of making him feel better if he ever called, I told him I was. I hadn’t planned on returning, but John’s call reminded me how gratifying it is to work at the YMCA. That summer, I showed up to the first day of camp with a big smile on my face. I strongly encourage every young Camp Counselor to realize how much of an impact they can have on children’s lives and to make sure that they are always acting as role models. You’re more than just a Camp Counselor to these children; you’re a mentor, teacher and confidant. There are many other children like John who need some guidance and companionship and you could be the person to give them that.